My cloning journey goes back a few years, before I decided to clone my best friend, Bruce Wayne. I had known about cloning for some time now, however, I only knew about it being performed in my home country, South Korea. While I would love to visit South Korea one day, I knew that there was no way I could handle the plane ride, especially with a puppy or two. Before I had Bruce Wayne, I had a Chihuahua puppy named Loki. Sadly, Loki was sick and spent more time in the ER than he did with me. I knew back then that I wanted to clone my dog, but didn’t know that there was actually an opportunity to within the United States. I, like many pet parents, was left saying “if only I had known”. Fast forward a year, I brought home the sweetest, most handsome, big eared Chihuahua, Bruce Wayne. I made it a mission that one day I would have Bruce Wayne cloned. I would not make the same “mistake” I did with Loki and let the opportunity pass me by. I had talked with Bruce Wayne’s Veterinarian about this, as we were both intrigued by the science and technology behind cloning. While at a dog conference in 2017, I met Lauren and Melain of ViaGen Pets. I literally got goosebumps just talking to them and learning that genetic preservation and cloning could actually be done in the United States! My dream of cloning Bruce Wayne was starting to become a reality! 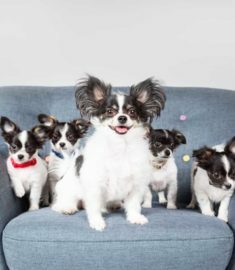 Everyone has their reasons for preserving their dog’s DNA and/or cloning. For me, my reason was simple: Bruce Wayne is my best friend. We literally do everything together. There’s nowhere that I go that Bruce Wayne isn’t right by my side. My family often jokes that I love him more than I love them! I went into the cloning process with simple standards. I just wanted a puppy clone that resembled Bruce Wayne and maybe had a trait or two of his. I wasn’t expecting an exact robotic copy of Bruce Wayne. I just wanted to see a glimpse of Bruce Wayne in the puppy clone. What I got still amazes me today. I was blessed with 5 Bruce Wayne puppy clones! I decided to give 1 of the puppies to a great friend of mine that also has a small Chihuahua and lives nearby. We often have playdates and I get to see the puppy, now named Harvey Dent” often. I decided to keep the other 4 puppies, who have been named “Tony Stark”, “Clark Kent”, “Peter Parker” and “Wade Wilson”. While each puppy has a slightly different personality, I would say that their similarities outweigh their differences. As a whole, they are a lot alike both looks and personality wise, but once you get to know them, you can see a slight difference in them. I believe each puppy has an exaggerated strain of Bruce Wayne’s personality. For instance, Tony Stark is very calm and chill; Peter Parker is very sweet and loving; Wade Wilson has some anger issues; and Clark Kent is incredibly jealous. Each of their personality traits are a piece of Bruce Wayne’s. One of my biggest delights is watching their mannerisms and how closely they resemble Bruce Wayne’s. If you didn’t know Bruce Wayne like I do, it may be hard for you to spot, but every pet parent knows their pet’s qwerks/tendencies and seeing these in the puppy clones is amazing to watch. It can be something as small as the way the puppies stretch like Bruce Wayne to what they like that is just like Bruce Wayne. Again, for me, it’s all about seeing and feeling that “special something” that is just like Bruce Wayne that brings a smile to my face.